French Ursulines arrived in New Orleans in 1727 and established the oldest school for girls currently operating in what is now the United States. During a per iod of crisis after a large group of nuns left New Orleans for Cuba in 1803, Mother St. Andre Madier, one of the seven nuns who remained, appealed to her cousin, an Ursuline in France whom the reign of terror had forced to leave her monastery at Pont-Saint-Espirt. She was Mother St. Michel Gensoul, a remarkable woman of great talent and interior piety, who, during the exile in Montpellier, opened a boarding school for girls there. Fearing for the flourishing school, Bishop Fournier refused to request her leave, saying that only the Pope, then a prisoner of Napoleon, could give such a permission. One day while praying before a statue of the Blessed Mother, she was inspired to say, “O most holy Virgin Mary, if you obtain a prompt and favorable answer to my letter, I promise to have you honored in New Orleans under the title of Our Lady of Prompt Succor.” The situation was near impossible. But this did not discourage Agathe, who immediately wrote a letter to Pope Pius VII, but after three months, she was still without means to send it. She not only found a way to send the letter a few days later, but the Pontiff replied within a month! He granted his permission, blessing her new undertaking, which surprised the bishop who asked to bless the statue that Mother St. Michel had carved to take with her to New Orleans. 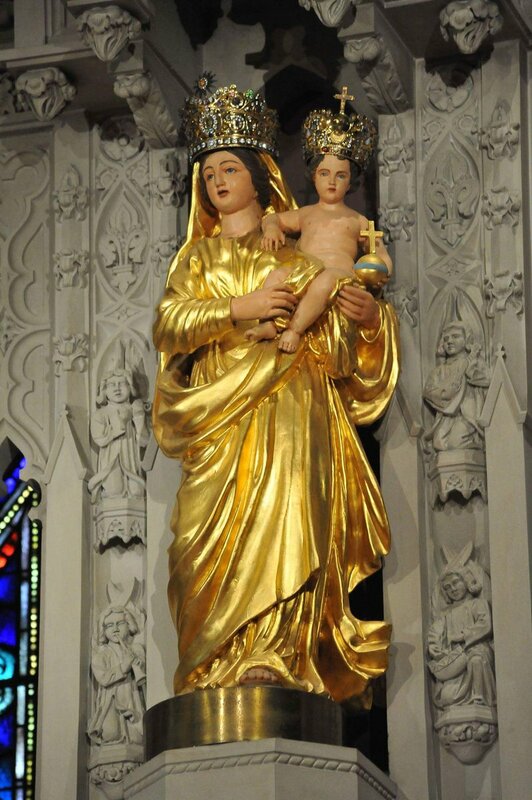 Since the end of December 1810, when Mother St. Michel, her companions and the statue arrived in New Orleans, devotion to Our Lady of Prompt Succor has grown in New Orleans and Louisiana, and has spread through the United States and even beyond. In the late 19th century, Pope Leo XIII granted the solemn crowning of the statue, an honor carried out splendidly by Archbishop Janssens on November 10, 1895. In 1912 this devotion was officially approved by Rome. 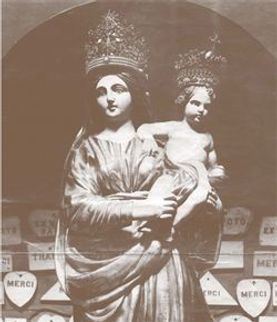 From conversations, letters, contributions, requests for Masses of thanksgiving and similar sources, generations of Ursulines and friends of Our Lady of Prompt Succor have learned about many of the favors granted through the intercession of Our Lady in response to pleas for quick and favorable help. We will never know them all. But those we know are a source of encouragement and hope to all who count on Our Lady’s help. Among them, two interventions of Our Lady in particular come from early New Orleans as important to the city and its people. The first has to do with one of the great fires which periodically threatened the city, the Ursuline Convent included. Frightened residents joined the sisters in the convent chapel, begging Our Lady to save them and their homes from the raging wind and flames. Finally, as the blaze drew too near, the Superior ordered all to evacuate the building. Before leaving, one of the sisters put a small statue of Mary with her Son into a window facing the approaching fire, with the prayer “Our Lady, unless you hasten to save us we are lost!” Then she followed the others to safety. Within minutes, the wind turned back on itself, and in a short time, the fire had lost its momentum and burned out, leaving the remainder of the city unharmed. 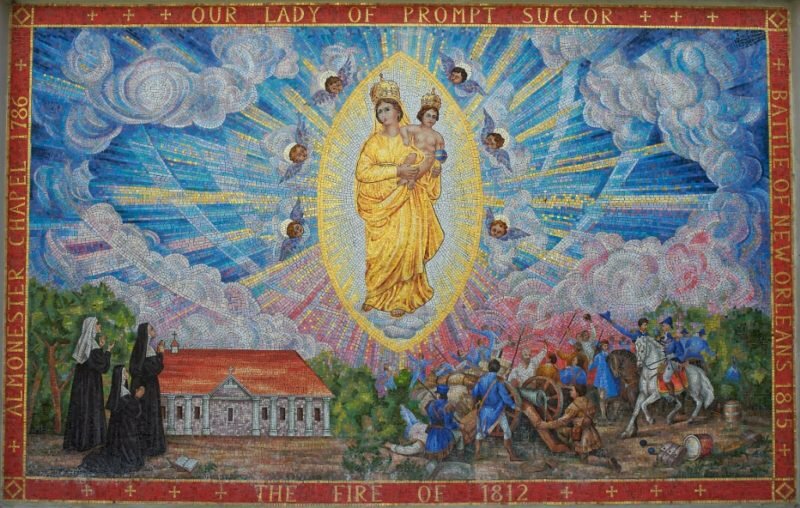 The second well-known intervention of Our Lady of Prompt Succor concerns the Battle of New Orleans, January 8, 1815. During the night of January 7, Andrew Jackson and his relatively small, little-prepared and ill-equipped band of soldiers organized their defenses against the large, very well equipped British army which would attack the city before dawn. 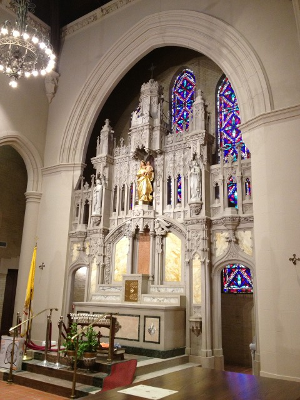 At the same time, many citizens not directly involved in the army joined the Ursuline Sisters in an all-night vigil in their chapel on Chartres Street, imploring Our Lady of Prompt Succor to give the victory to Jackson for the United States, saving the city of New Orleans from British control. During the night, the Superior, Mother Ste. Marie Olivier de Vezin, promised Our Lady that if Jackson and his men won, a Mass of thanksgiving would be sung every year in memory of her saving help to the city on that day. As dawn was breaking, Fr. DuBourg began a Mass for the same intention. At the very moment of Communion a courier rushed into the chapel announcing that Andrew Jackson and his men had won the victory, and the Mass ended with the joyous singing of the Te Deum. Mary’s help has been sought from the shrine ever since, both in time of war [the Battle of New Orleans] and during the threat of hurricanes, a persistent peril on the Gulf Coast. The internet address for one of the shrines in New Orleans is: The URL for the convent shrine was inactive at the time this page was uploaded, that is the one provided by our resource was no longer on line. The Rosary House does not carry this statue but can order it. Our Lady of Prompt Succor of laborers in the Lord’s vineyard, pray for us. V: Our Lady of Prompt Succor, pray for us. R: That we may be made worthy of the promises of Christ.O Almighty and Eternal God, Who sees us surrounded by so many dangers and miseries, grant in Thine infinite goodness that the Blessed Virgin Mary, Mother of Thy Divine Son, may defend us from the evil spirit and protect us against all adversities, that always and with prompt succor she may deliver us from every evil of soul and body, and safely guide us to the kingdom of Heaven, through the merits of Our Lord Jesus Christ, Thy Son, Who lives and reigns with Thee in the unity of the Holy Spirit, one God, world without end. Amen. O Almighty and Eternal God, seeing us surrounded by so many dangers and miseries, grant in Thy infinite goodness that the Blessed Virgin Mary, Mother of Thy Divine Son, may defend us from the evil spirit, protect us from all adversities, obtain for us mention your request here and safely guide us to the kingdom of Heaven. This we ask of Thee through our Lord Jesus Christ, Thy Son, who lives and reigns with Thee in the unity of the Holy Ghost, God, forever. Amen. O Mary, Mother of God, amid the tribulations of the world, watch over the people of God and be to us truly Our Lady of Prompt Succor. Make haste to help us in all our necessities, that in this fleeting life you may be our succor. Obtain for us mention your request here Help us to gain life everlasting through the merits of Jesus, thy Son, our Lord and Redeemer. Amen. Our Lady of Prompt Succor, thou art after Jesus our only hope. O Most Holy Virgin, whose merits have raised thee high above angel choirs to the very throne of the Eternal and whose foot crushed the head of the infernal serpent, thou art strong against the enemies of our salvation. O Mother of God, thou art our Mediatrix most kind and loving. Hasten, then, to our help, and as thou didst once save thy beloved City from ravaging flames and our Country from an alien foe, do now have pity on our misery, and obtain for us the graces we beg of thee. Deliver us from the wiles of Satan, assist us in the many trials which beset our path in this valley of tears, and be to us truly Our Lady of Prompt Succor now and especially at the hour of our death. Amen. Say an Our Father, Hail Mary, and Glory be then the Litany of Our Lady of Prompt Succor [below] after the prayer “O Mary, Mother of God”. O Mary, Mother of God, who amid the tribulations of the world, watches over us and over the Church of thy Son, be to us and to the Church, truly, Our Lady of Prompt Succor; make haste to help us in all our necessities, that in this fleeting life thou may be our succor, and obtain for us mention your request here Help us to gain life everlasting through the merits of Jesus, thy Son, Our Lord and Redeemer. Amen.